Gain the leadership edge you need for an industry where the frontiers are always advancing. Designed for working professionals, and offered by one of the world’s pre-eminent universities, the program will transform the way you think, lead and drive innovation internationally. It is an intensive 18-month journey that immerses you in key healthcare clusters around the world. By learning from leading faculty and experienced sector leaders, you will gain the knowledge and skills you and your organization need to succeed. And while you explore current and future best practices globally, we’ll guide you through an in-depth assessment of your own capabilities, with the goal of helping you become a more impactful leader. Candidates are mid-to-senior level professionals from industry, providers and service delivery organizations, consulting firms, public agencies, science, and payers in the healthcare and life sciences sector around the world who seek to advance their leadership careers. The program is designed to link the traditional silos in which healthcare providers, payers, scientists, suppliers, agencies, and other stakeholders typically interact only at arm’s length. The program brings together participants from across the full sector and teach why and how you can create patient value and system strength by integrating more effectively across boundaries, both within and across organizations, regions and countries. Classes take place onsite in Toronto, the San Francisco Bay Area, Singapore and online. The curriculum is designed for you to examine what’s possible ‘at home’ — wherever your home is — by learning from other systems. Site visits and networking events introduce you to senior executives who are experts in doing business in the region. You will hear first-hand about their paths to leadership, gaining a real-world perspective that will have an extraordinary impact on your learning experience. Toronto is ranked as one of the world’s top start-up ecosystems. The University of Toronto’s ONRamp is a 15,000-sq.ft. collaboration and community space dedicated to supporting student entrepreneurs. Steps away from the University, the medical Discovery District hosts and supports entrepreneurial development, while U of T invests over $1 billion per year in healthcare-related innovation alone. Enjoy a full-campus experience at the downtown St. George campus of U of T, just blocks from the local business community. Established in 1827, U of T is a global centre of research and academic excellence and is recognized worldwide as Canada’s leading university — a reputation that adds tremendous value to your Rotman MBA. The San Francisco Bay Area is a hub of entrepreneurial activity and the base for many established healthcare and life sciences firms. Likewise, Singapore is a global hub for healthcare services and life sciences commerce. We look for mid- to senior-level experienced professionals from industry, providers and service delivery organizations, consulting firms, public agencies, the sciences, and payers in the healthcare and life sciences sector around the world who seek to advance their leadership careers. Successful completion of the GMAT/GRE or the Rotman Executive Diagnostic Test (EDT) is required as part of the application process. Please contact us to discuss whether the EDT options applies for you. Note: To qualify for the program, you’re advised to arrange your work schedules and personal and professional responsibilities to allow you to complete the necessary class-work and self-study. You may also consider asking your employer’s consent for the time you will spend away from work. Some students also request financial support from their employers in exchange for increased corporate performance. Please contact gemba-hls@rotman.utoronto.ca for further guidance. Students are responsible for travel and accommodation for the Singapore and San Francisco modules. Please note that all fees are set annually and are subject to change. The Rotman School is invested in attracting strong candidates. You will be automatically considered for entrance awards as soon as you apply for the Global Executive MBA for Healthcare and the Life Sciences. These awards are based on the overall strength of your application. Some of the things we look for during this assessment are leadership qualities demonstrated through professional and academic experiences. Candidates who are selected to receive an entrance award will be notified when they receive an offer of admission. The earlier you apply the better your chances of receiving a tuition discount. You will be automatically considered for tuition discounts, awards, and fellowships when you apply. Our personalized approach aims to streamline your application process, and ensure that the program is the right fit for your career and personal goals. All complete applications are presented to the Admissions Committee on a weekly basis. A member of our admissions team will get back to you as soon as a decision on your application is made. Apply early as space is limited. Contact us anytime at 416 946 3638 or GEMBA-HLS@rotman.utoronto.ca to find out more. Or, create your profile to receive regular program updates. The 18-month Global Executive MBA in Healthcare and the Life Sciences offers an innovative curriculum that combines core management skills and practical engagement with deep self-development insights and strategic know-how, all designed for the healthcare and life sciences sector. The globally-oriented program emphasizes the best of health systems and business, leading strategic change, data-driven decision-making, and entrepreneurship and innovation. Faculty draw on research, industry examples, case studies, and guests from Canada and around the world to enhance the learning experience. Each module of the program involves on-site experiences with firms and organizations that are leading healthcare and life sciences innovation in multiple countries. Class sessions provide meaningful opportunities for leaders from across the healthcare and life sciences sector to learn about each other’s organizations, to develop networks, and to explore new ways to create the healthcare organizations and health systems of the future. You’ll earn a top-tier MBA from one of the world’s leading business schools, with courses customized and designed for the healthcare and life sciences professional. The program’s 23 courses are structured in six modules. These include 14 core MBA curriculum courses (contextualized to the healthcare and life sciences sector) and nine sector-specific courses. The program is delivered in a blended model, primarily face-to-face, supplemented with online learning. Online learning includes pre- and post-module work for the residency courses. Students also work on assignments, group deliverables and exams. The schedule has been designed for personal and professional flexibility. The content will be delivered using a blended delivery model that weaves together in-class and on-site learning, with online support . Approximately 75 percent of sessions will be conducted face-to-face -- in the classroom and in the field. The Rotman School focuses on developing healthcare and life sciences professionals and managers into powerful executives and leaders. Through a personal leadership development plan, one-on-one coaching and experiential learning, we will help you reach a deeper understanding of your strengths and true career potential. Create a personal leadership development plan and follow it throughout the program in a process of learning, applying and reflecting. How you define success, and your path to success, are the key factors in building your plan. Receiving valuable feedback from a variety of sources is the cornerstone of personal development. Multiple assessments will help you understand your skills and develop better self-awareness. Your executive coach will help you explore key areas of your personal leadership development plan and focus your attention on what is working well and what needs to change, based on your assessment and team feedback. The program's learning methods ensure you can immediately apply the insights you gain in class into practice. To that end, we provide you with a personalized leadership development program. Using 360 degree assessments of competencies and skills, you will be coached to create customized development plans, practice new skills, and apply key insights as you move through the curriculum. You will have access to career coaching staff and networking events as you chart your career path for the future. Gain critical knowledge of group dynamics and the actions you can take to achieve success as a high-performing team. The leadership retreat helps you see yourself and your world through new lenses, recognizing that complexity, ambiguity and challenges are opportunities for innovation, reinvention and renewal. Gain access to a wide network of leaders from different parts of the healthcare and life sciences sector through the HLS Leadership Network, an exclusive network of senior executives who have been carefully selected to reflect a variety of career and life experiences. The advisors will assist students with first-hand knowledge about specific industries, functions, business problems and most importantly, provide advice on their career options. Engage both in person and remotely with a variety of advisors, and tailor your studies to your own business and career learning objectives. The Rotman School is deeply engaged with the business community, creating innovative partnerships in key sectors from life sciences to high tech and financial services. We share insights and ideas with a wider audience through special events, publications and speaker series. Each year, Rotman hosts over 100 public talks by bestselling authors, senior management executives, award-winning journalists, and other business thought leaders. The real-world perspectives, insights and inspiring stories shared by our speakers have an extraordinary impact on our students. Since its launch in 2012, the Creative Destruction Lab (CDL) has become one of the world's fastest-growing venture labs, creating over $1 billion of equity value in under five years. Early-stage ventures from all over the world apply to work with the CDL, with many coming out of the research programs of leading global universities. Selected MBA students, along with some of Canada's most successful entrepreneurs, play a vital role by providing strategic insights and business development support. The Rotman faculty is renowned for its thought leadership. Their groundbreaking insights travel from the classroom and research centres to the boardrooms of organizations that are shaping the future of business. The two academic directors have extensive backgrounds in the health and life sciences sector and have taught in North America, Europe, the Middle East, Africa, Latin America and Asia. Professor Brian Golden is the only business school professor to be inducted as a Fellow of the Canadian Academy of Health Sciences and was the inaugural recipient of the Canadian Medical Association’s Award for Innovation in Physician Education. Brian is cross-appointed in the Dalla Lana School of Public Health. Professor Will Mitchell has extensive experience with health and life sciences research, teaching, and business in multiple countries. He has an appointment at Duke University, including engagements with the Duke Medical School and Business School. Will is a board member of Neuland Laboratories, Inc., a pharmaceutical company based in Hyderabad, India. Her research interests include the coordination of complex and interdependent work, sense-making in high-risk environments, and resilient organizing, particularly as it relates to error detection and correction. Academic director of theDirector's Education Program, a board member of the Rotman international Centre for Pension Management, and a fellow of the Michael Lee-Chin Family Institute for Corporate Citizenship. Leads the World Health Organization's Collaborating Centre for Bioethics at the University of Toronto and has advised on government advisory committees on health system integration and other topics. Has published over 50 articles in economics, artificial intelligence, marketing, statistics, and law. Research focuses on the use of IT and data on organizational design and strategy, and she has worked for two start-up technology companies in Silicon Valley. Expert in behavioural economics and has consulted with Microsoft, FedEx, P&G, life Insurance company of India, Corus Entertainment, and the Hong Kong Government. He is the author of The Last Mile: Creating Social and Economic Value from Behavioural Insights. Hospitals that are closer to universities in offering both medical and business education with higher management quality. Supplying joint MBA-healthcare courses may be a way for universities to increase medical business skills and raise clinical performance. Business schools have been attempting to meet a need for physicians and scientists seeking to combine their technical backgrounds with a deeper understanding of the business side of healthcare. The Rotman School feels there’s more to be done. Leaders in healthcare know to align the interests of their employees and staff with those of the organization: to make them partners. The most robust health systems bring physicians into the process and align their interests with those of the hospitals. "It takes a really brave leader to challenge the status quo, to challenge the inertia of the status quo, the safety of the status quo, to drive real innovation in the healthcare system." "One of the greatest opportunities in programs like this is the opportunity to get information-- intelligence, ways of thinking-- that are way beyond our borders." "People are moving around, but they're finding positions and they're excited about those positions. It's a very dynamic industry. " The University of Toronto Global Executive MBA for Healthcare and the Life Sciences program uses a rigorous set of admission criteria, based on a combination of academic abilities, interpersonal skills, and employment credentials. We look for high achievers who can already demonstrate significant professional success and potential for advancement. Typically, students are experienced managers who have lived and worked in at least two countries. Tip: The earlier you apply, the greater your chance for an entrance award. Please send us your resume to gemba-hls@rotman.utoronto.ca. We will review your qualifications and credentials and contact you within two business days to advise you on your suitability for the program and to discuss next steps. 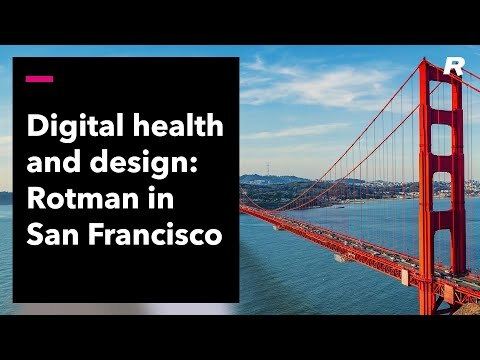 The perfect combination: digital health perspectives from the San Francisco Bay Area with knowledge and strategy from Rotman's Global EMBA for Healthcare and the Life Sciences.